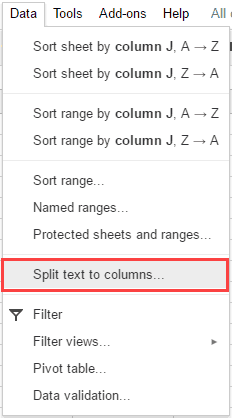 You can use the Split Text to Columns in Google Sheets to quickly split the contents of a cell (or a range of cells). 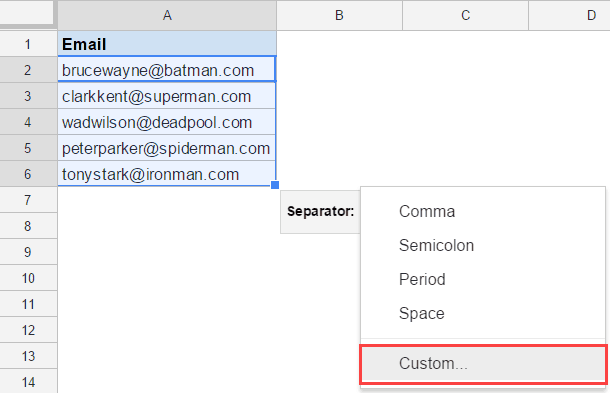 Split Text to Columns feature comes in handy when you want quickly split the first name and the last name, or the uusernameand domain name from an email id, or the domain name from URLs. 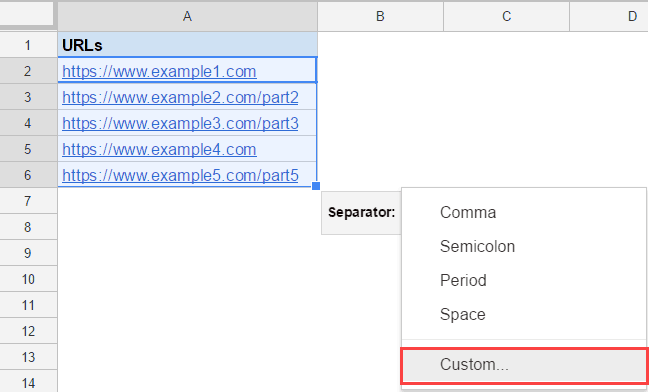 In this tutorial, I will show you multiple examples on how to split text to columns in Google Sheets. Select the data that you want to split. Click on Split Text to Columns from the drop down. In the Separator dialog box that appears at the bottom right of the data, select space as the delimiter. That’s it! It will instantly split the names into the first name and the last name. When you use the split text to column, it overwrites the original data set. If you want to keep the original dataset intact, create a copy of the data set and use Split Text to Column on that data set. It would give you static result. This means, that your data would not update in case you update the original dataset. If you want this to be dynamic, use the split function. Every space character is considered as a different separator. In case you have a double space between names and you use the space character as the delimiter, it will split the name into 3 columns. 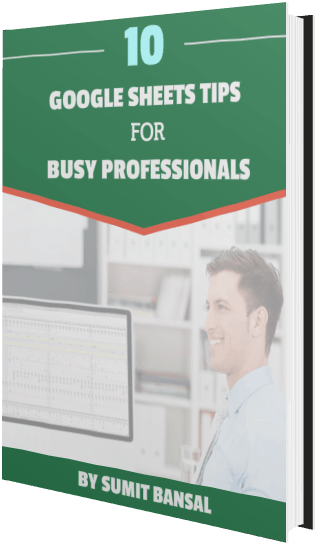 In such cases, remove the double space by using the TRIM function [there is a text to column functionality in Excel to consider consecutive delimiters as one. I hope that is also adopted by Google Sheets]. In the Separator dialog box that appears at the bottom right of the data, select Custom. In the Custom field, enter @. 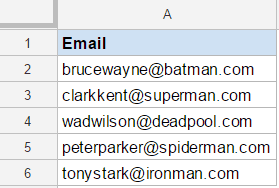 As soon as you enter @, Google Sheets will instantly split the text into username and domain name. Again, remember that this will overwrite on the original dataset. 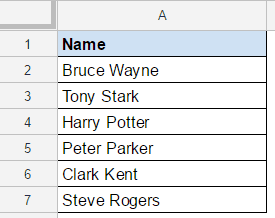 If you want to keep the original data set intact, create a copy and then use Split Text to Columns feature. 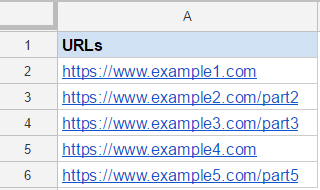 Note that there is a mix of URLs where some only have the root domain and some have links to a specific page/post. Note that as soon as you enter /, the URLs will spit and the domain name would be in column C.
Now if you’re wondering why column B is empty, it’s because there are two forward slashes after HTTP in the URLs. Each forward slash is treated as an individual separator. Also, note that this technique works when you have the domain names in the same format. For example, if you have one with HTTP and one without it, then it may give you the domain names in different columns. 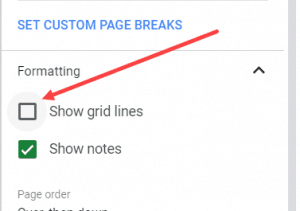 How to Quickly Merge Cells in Google Sheets. 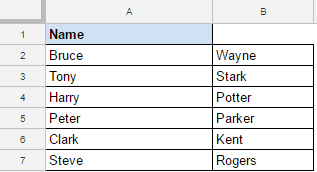 How to Quickly Freeze Rows in Google Sheets. 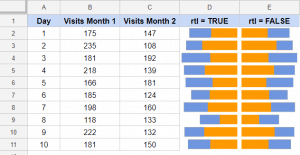 How to Transpose Data in Google Sheets. Inserting Timestamps in Google Sheets. 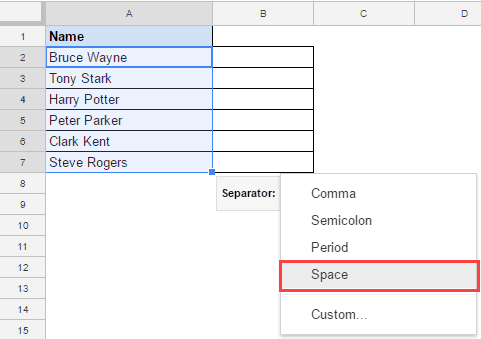 Concatenate in Google Sheets – Combine Cells Using Formula. 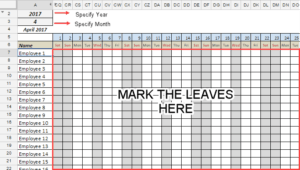 Google Sheets is a relatively new spreadsheet tool in the market. 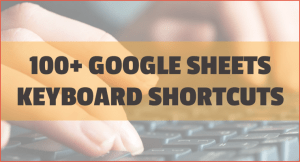 It has quickly gained a lot of fan following and I see a lot of people migrating from other spreadsheets applications to Google Sheets.